If, Dear Reader, you are already involved in the hospitality industry, you may have been aware of a bit of a kerfuffle in the early spring of 2016 when Huffington Post published an interview with Jon Taffer (the moronic host of the ridiculous show, Bar Rescue) in which he claimed (among other imbecilic declarations) that tequila was hallucinogenic because it was derived from mescaline. As a great many important people within the industry gleefully pointed out, the two substances have nothing to do with each other. As a supposed "expert" on all things alcohol, Taffer's gaffe is inexcusable, but for the average person who may not be as familiar with distilled spirits, the difference between mezcal, tequila, sotol, and the other distillations coming out of Mexico can be confusing. In this post we'll examine what makes these various spirits different and what makes them similar and hopefully open your tastes to a whole world of great booze beyond tequila. Although Mexico produces a variety of fermented beverages and spirits including rum, whiskey, and even fernet, the ones we're interested in for this post are those derived from plants in the family Asparagaceae. These include mezcal and it's various subclassifications such as mezcal, tequila, raicilla, bacanora, tuxca, and other non-mezcal spirits like sotol and comiteco. If you were reading carefully you may have noticed mezcal mentioned twice in the previous sentence, and although it may look like a typo, mezcal is actually a subcategory of mezcal, which is probably part of the reason that there is some confusion surrounding all these different spirits. 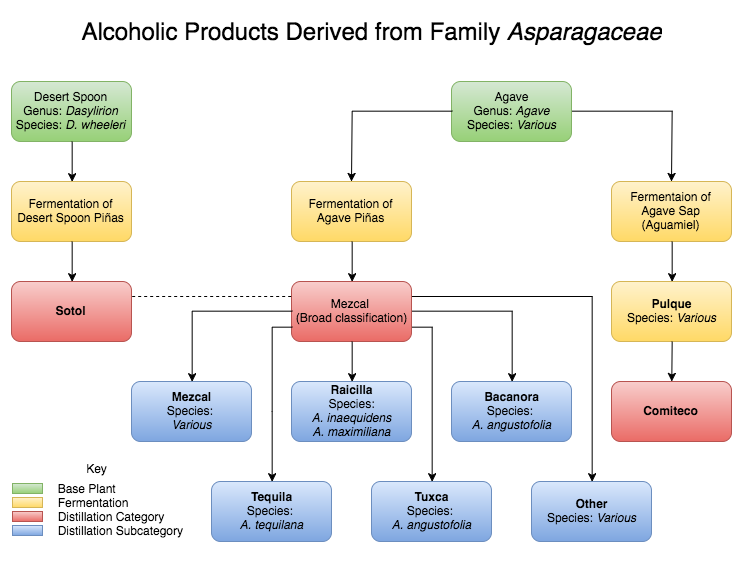 To begin to clear things up, take a look at this flowchart of alcoholic products derived from plants in the family Asparagaceae. All these different spirits are classified based on the type of plant used in their production, the production process, and the area of Mexico in which they are produced. Except for sotol, the principle plant used to create them is the Agave, a genus of flowering succulents with over two hundred different species and natural hybrids. The other plant of interest to us is Dasylirion wheeleri, common name Desert Spoon, which was once thought to be part of the Agave genus but has been reclassified in recent years due to DNA testing. Desert Spoon is a spiky evergreen shrub from which sotol is distilled. Since sotol is made from Desert Spoon and not an agave varietal, it is technically not mezcal (mezcal is any distillation of fermented agave piñas), however, because it was once thought to be an agave distillate, most references (and most of the people of Mexico) still consider it mezcal. There are two ways of using the agave plant to produce alcoholic fermentations. One method is to ferment the sap of the agave (called aguamiel) and the other is to ferment the heart of the plant (called the piña). These distinct processes produce fermentations with very different tastes and the subsequent distillations are dramatically different as well. The native people of Mexico have been making pulque—sometimes referred to as Mexican mead—for over a thousand years. The milky-white drink is a viscous and slightly sour beverage made when aguamiel is fermented. If pulque is then distilled, the resulting spirit can be called comiteco. Pulque can be produced from several varietals of agave but the most common is Agave americana, or maguey. Aguamiel can only be drawn from large plants, which usually take around twelve years to mature. Once mature, the aguamiel is drawn off using taps similar to those placed into maple trees to draw off the sap that eventually becomes maple syrup. A single maguey plant will produce up to six liters of aguamiel per day and can survive for up to a year after being tapped. On average, each maguey plant produces around 600 liters of aguamiel before it dies. Traditionally, the extracted aguamiel is taken from the field to a fermentation house called a tinacal and placed into large vats called tinas to begin the fermentation process. Unlike beer production which uses various species of yeast as the fermentation agents, pulque is fermented when a bacterium, called Zymomonas mobilis, digests the agave sugars and excretes ethanol. The fermentation is a delicate process and temperature and humidity must be carefully controlled to prevent the pulque from souring. At the height of the fermentation process, the pulque is transferred to barrels and shipped to market. It continues to ferment until consumed so it must be imbibed within a short window of time before it goes bad. The short shelf life is part of the reason it is essentially unavailable outside of Mexico. Pulque is not the only fermented agave beverage consumed in Mexico, the intermediate fermentation of the agave piñas during mezcal production, called tepache is apparently delicious as well but not usually available commercially. Comiteco is the distillation of fermented agave sap (pulque). Beyond that, information on comiteco is hard to find. So if any of my readers have insights, please comment below and I'll incorporate any info into an updated post. From what I've been able to glean from the few Spanish-language sites that have some information on it, there doesn't seem to be a legal definition for the spirit. However, some historical norms apparently exist. To be called comiteco, the spirit must be distilled in the Mexican state of Chiapas and is traditionally derived from pulque made from Agave americana (although it appears other agave species can technically be used). Comiteco has a very different taste than mezcal but like other agave spirits, it has various aging classifications including blanco, añejo, and reserva especial. It is frequently flavored by infusing fruits such as peach, blackberry, and jobo into the final distillate. I've never tried comiteco but I would love to; my research has not turned up a single American distributor so I may just have to take a trip down to Chiapas to get the real deal. As I mentioned before, mezcal is both a broad category of spirits and a narrow, legally defined product. Broadly, mezcal is classified as any spirit distilled in Mexico from the heart of any species of agave. Mezcal is produced, importantly, not from the agave sap used to make pulque, but from the agave piñas themselves, it is NOT distilled pulque. By this definition, mezcal encompasses the legally defined spirits of tequila, raicilla, bacanora, tuxca, the legal subcategory mezcal, and historically speaking, sotol, as well as those agave distillations without a legal definition, usually labeled simply, "agave distillate". Because the process for making sotol is so similar to the process for making mezcal, I'm going to talk about them as if they were in the same category, even though they technically aren't. The production of mezcal starts with the harvesting of the agave piñas (or in the case of sotol, the Desert Spoon piñas). The piña is the heart of the plant and they can weigh up to two hundred pounds. Piña means pineapple in Spanish and the hearts, without the spines, do resemble the tropical fruit. Depending on the species and the region in which they are grown, the plants reach maturity after seven to thirty years, at which point they are dug up, the spines are cut off, and they are prepared for fermentation. Depending on the variety of mezcal being produced, this means either boiling the piñas, cooking them in an oven, or roasting them in earthen pits. The process of cooking the agave piñas breaks down the complex carbohydrates within the plants cellular walls, turning them into basic starches and simple sugars that are more readily fermented. Then the piñas are ground up. For the larger operations, industrial shredders are used for this step but many mezcals come from tiny batches and in these productions, the agave hearts are ground manually with traditional horse-drawn stone wheels called tahonas. The grinding process extracts the juice of the piña, which is (often) combined with water and poured into large fermentation tanks where it ferments for several days. The fermented product, called tepache, is then distilled twice in either column stills for large, industrial tequila production, copper pot stills, or even traditional clay pot stills for the super small batch, artisanal distillations. In some cases, the mezcal is then aged for a period of time in oak barrels. Water is then added to bring the mezcal to final proof and the spirit is bottled. Although mezcal is a broad category that encompasses all distillates derived from fermented agave piñas, for a producer to label their product, "mezcal" it must be made under certain conditions. First and foremost, it must be made in one of the eight states that have received legal status from the mezcal regulating authority of Mexico (the CRM): Oaxaca, Durango, Guanajuato, Michoacan, Guerrero, San Luis Potosí, Tamaulipas, and Zacatecas. Oaxaca is the largest Mezcal-producing state, with roughly 80% of distillations originating there. There are over two hundred subspecies of maguey or agave and Mexican law allows any of them to be used in the production of products labeled "mezcal" as long as the varietal is not used as the primary material in other government Denominations of Origin, which means that products labeled "mezcal" cannot be distilled from Blue Agave. In practice only about 30 agave varietals are used in the production of mezcal with espadín, arroqueño, cirial, barril, mexicano, cincoañero, and tobalá being the most important. When it comes to agave-based distillations, there is no doubt that tequila reigns supreme, especially in the US. The United States accounts for 52% of global sales and since 2002, US domestic sales of tequila have increased by an average of 5.6% per year, making it one of the fastest growing spirits in America. Tequila is distilled from fermented agave piñas and is therefore a mezcal. But it differs from mezcal, the legally defined spirit, in several subtle ways. First, unlike the wide range of agave species that can be used to make mezcal, tequila can only be made from the Blue Agave, latin designation Agave tequilana. Tequila can only be produced in the states of Jalisco, Guanajuato, Michoacan, Tamaulipas, and Nayarit. Jalisco is historically the most important area for tequila production and where the town of Tequila is located. Three states—Guanajuato, Tamaulipas, and Michoacan—are legally allowed to produce both tequila and mezcal. While most mezcals are made in small batches using traditional methods, the majority of tequila production has become fairly industrialized. The agave piñas are harvested in much the same way as they are with mezcal but that's where the similarities stop. In tequila production, the agaves are baked not in earthen pits but in large industrial pressure cooking ovens known as autoclaves (in the lowest quality tequilas, the agaves are sometimes boiled instead of baked). Cooking the agave piñas in autoclaves instead of slow roasting them in earthen pits saves tequila producers a lot of time and money and, more importantly, gives tequila a much softer, less smokey character that many people prefer. Once cooked, the piñas are shredded using industrial shredders (instead of ground using traditional tahonas) and the resulting pulp and juice is fermented in huge fermentation tanks for several days. The fermented mash is then distilled using large stainless steel or copper column stills. Column distillation is a much cheaper and faster process than the pot distillation used in most mezcal production. Unlike mezcal, which, since 2015, must be 100% agave, tequila needs to consist of only 51% agave. This creates two broad categories of tequila: tequila mixto, and 100% agave tequila. Those tequilas designated as 100% agave must be fermented from Blue Agave grown in one of the legally defined tequila regions in Mexico but for tequila mixto, it's a bit more complicated. In mixtos, the Blue Agave can be "enhanced" with other sugars in the fermentation process up to a proportion not exceeding 49% of total reduced sugars (expressed in units of mass). Cold mixing, that is, blending 100% agave distillate with neutral cane spirit prior to bottling, is not permitted. The portion of the mixto not made from Blue Agave may not be made with sugars from any species of agave; cane sugar is usually used. Mixtos are, in general, lower in quality than tequilas that are made from 100% agave. Tequila oro (gold tequila, also called joven) is usually a mixto that has had artifical coloring or flavoring added to make it look aged. However, there are some 100% agave oro tequilas that are a blend of blanco and reposado tequilas, so not all gold tequila is necessarily artificially colored. Although tequila mixto must be produced in Mexico, the undiluted distillate can be exported in bulk to a bottling facility outside of the country where it is diluted down to final proof and bottled. Once distilled, the tequila is either bottled immediately or aged in oak casks for a certain period of time prior to bottling. There are several legally-defined stages of aging for 100% agave tequila: blanco, reposado, añejo, and extra añejo. Blanco tequila (also called plata) is either bottled directly after distillation or rested several weeks in neutral stainless steel or glass tanks prior to bottling. This brief resting period mellows the spirit slightly, softening the alcoholic intensity. Reposado tequilas are aged in oak casks for more than two months but less than one year, añejo tequilas are aged for more than one year but less than three years in oak casks not larger than 600 liters, and extra añejo tequilas are aged for more than three years in oak casks not larger than 600 liters. All aging must take place within one of the designated tequila producing regions of Mexico and, unlike tequila mixto, all 100% agave tequilas must be diluted to final ABV and bottled in Mexico. Raicilla is an agave distillation produced in the western part of the state of Jalisco. The name means, "small root" and the two agave varietals used in raicilla production are smaller than those used in other mezcals. Raicilla can be made from the pata de mula (mules foot) agave, latin designation, Agave maximiliana and the lechuguilla agave, latin designation, Agave inaequidens. Although in the past, raicilla was illegally distilled as moonshine, in recent years raicilla producers have organized themselves into a cooperative and started forming rules for what makes Raicilla a distinct mezcal. There is no official recognition of the spirit within Mexico but that will likely change in the coming years as raicilla producers gain more say in their product. The flavor of raicilla varies depending on the area of Jalisco it is produced. Mountain regions produce a spirit that tastes a bit like Sotol, it's woody, earthy, a high degree of minerality and herbaciousness with just a touch of citrus. The maritime raicillas are much more citrus forward, with bright flavors, and a touch of smoke, much like an espadín mezcal. Production methods follow those of other traditional mezcals, with the slight difference that the agave piñas are cooked in wooden ovens and then pulverized with wooden clubs instead of ground with stone wheels prior to fermentation. Once distilled, the spirit has a similar aging system to that of tequila with slight variations. Blanco raicillas spend no time in oak barrels, jovens spend less than a year, reposados age for between one and two years in oak, and añejos are aged for over two years before bottling. Bacanora is produced in the Mexican state of Sonora from the wild agave plant Yaquiana, latin designation, Agave angustifolia. It is named after the town of Bacanora and has a very similar flavor and production process to the legally defined spirit, mezcal, in which the Yaquiana piñas are roasted in earthen pits prior to fermentation. Bacanora has been a legally recognized mezcal within Mexico since 2000 but it is not internationally recognized. Tuxca is a distilled spirit derived from pit roasted agaves made exclusively in the southern part of the Mexican state of Jalisco in the area around Tux. The region is located in the midst of the Trans-Mexican Volcano Belt and the soil of the area is nearly all volcanic debris high in diverse mineral content. This unique soil lends tuxca a fascinating terroir rich in minerality. Coupled with the smokiness imparted by the pit roasting of the agaves, tuxca has one of the earthiest, almost dirty (in a good way) flavor profiles of any mezcal. The spirit is not legally defined within Mexico but it is traditionally a 100% agave product made from several different agave varietals including Lineño, Ixtero Amarillo, and Cimarrón. There are many other agave distillations within Mexico that don't fall within these categories. Nearly every village has a mezcalero or two making mezcal just as his ancestors have for generations, each one slightly different from anything else being made in the country. The government of Mexico has passed a few regulations for these other agave distillations that must be met if a producer wants to bottle and sell his creation. For the most part, these regulations are similar to those for tequila, with the principal requirement that the spirit be labeled simply, "agave distillation" if it isn't otherwise legally defined. As previously mentioned, sotol is made from Dasylirion wheeleri, not an agave varietal, and is therefore technically not a mezcal. But the agave and Desert Spoon are so closely related and the production process is so similar, that most of the people of Mexico consider it a mezcal. Sotol is produced in the Mexican states of Chihuahua, Coahuila, and Durango. Desert Spoon is a smaller plant than most of the agave varietals used to produce mezcal and, as a result, each plant produces an average of one bottle of sotol (compared with five to seven bottles of mezcal per agave plant). It has been a legally defined spirit within Mexico since 2004 but it doesn't have international legal recognition. I hope that you got something out of this whirlwind overview of spirits distilled from plants in the family Asparagaceae. I covered a lot but even so, I've barely scratched the surface of this complex category. Just to help you make some sense out of all this info, I created this chart that highlights a few of the differences between all these spirits. The category reminds me a lot of rum in that, even though each distillation starts with the same essential base ingredients, they can still be so wildly different. It's fascinating to taste different mezcals side by side to see how unique each one truly is. I highly recommend you try a new one next time you're at a bar with a nice selection. Under pressure from Taffer's people, I'm sure, Huffington Post has since removed the offensive quote from the article, so I'm posting it here for posterity. When he was asked if different kinds of alcohol affect people differently, Taffer responded, "I’m not sure if there’s a definition of one gets you angry or not, but tequila is inherently made from mezcal, which mescaline, the hallucinogenic drug is made from. So tequila can have a hallucinogenic component, you might be talking to someone who’s not there. (Laughs)"